Schwannomas account for approximately 30% of primary intraspinal tumors. Spinal Neurilemmoma are usually extramedullary intradural tumors. Because schwann cells are not normally found within the parenchyma of the spinal cord, intramedullary schwannomas are rare. Neurocysticercosis (NCC) is the most common helminth infection of the nervous system. The two main types of NCC are parenchymal and extraparenchymal. Extraparnechymal includes subarachnoid, ventricular, and spinal. Spinal cysticercosis can be leptomeningeal, intramedullary, or epidural. Spinal intramedullary cysticercosis refers to the presence of a cysticercal cyst within the spinal cord. Intramedullary spinal cysticercosis is very uncommon. To the best of our knowledge, this is the first report in world literature of intramedullary schwannoma coexisting with intramedullary cysticercus with no evidence of brain lesion. The present case concerns a 25-year-old male who presented to neurosurgery OPD with complains of low back pain radiating to right lower limb posterolateral aspect of thigh of leg for 3 years. He also complained of progressive ascending weakness starting from right lower limb up to hip followed by left lower limb for 2 years. He had numbness below groin for 2 years. Patient had poor urinary stream with feeling of incomplete evacuation for 1 year. The general physical examination of the patient revealed no apparent abnormality. Neurological examination revealed power in bilateral upper limbs was normal (5/5). There was spasticity in both lower limbs with power in bilateral hip and knee was 3/5 and power in ankle was 0/5. Bilateral cremastric reflexes were absent. Bilateral planters were equivocal. There was bilateral graded sensory loss for pain, touch, and temperature below L1 dermatome. 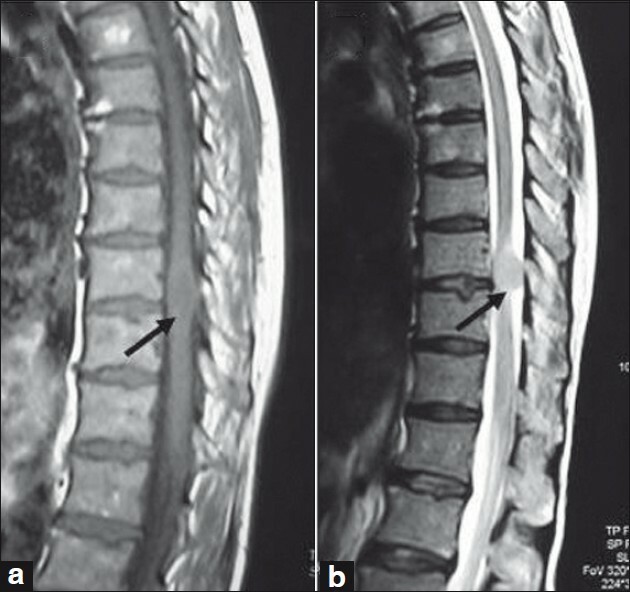 Magnetic resonance imaging (MRI) of spine revealed D10-D11 intramedullary lesion, which was T1 hypointense, T2 isointense lesion with contrast enhancement [Figure 1]a and b. The possibility of ependymoma was kept radiologically. Patient underwent D9-L1 laminectomy and excision of lesion. Intraoperatively, nerve roots and cord were shifted to left side and posteriorly. Tumor was grayish soft, minimally vascular with defined plane of cleavage. The patient developed paraplegia in immediate postoperative period, which gradually improved after giving methylprednisolone. 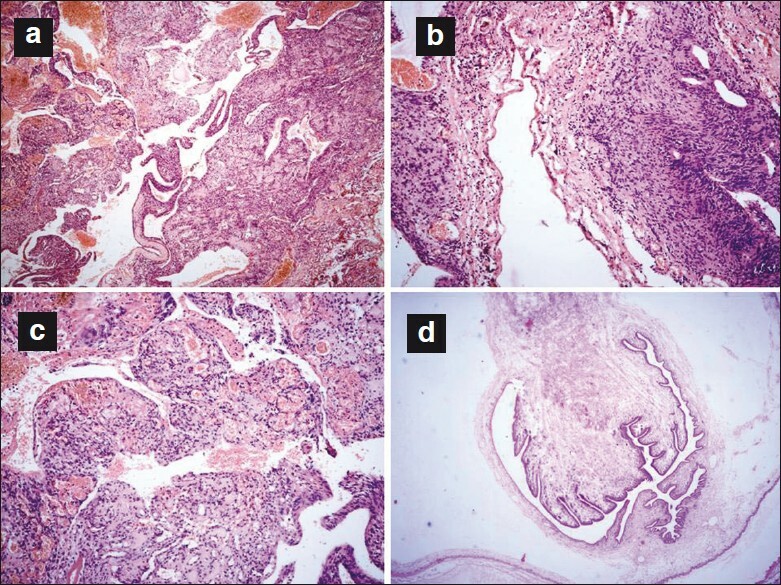 The histological analysis through hematoxylin and eosin staining (H and E) revealed the scolex and suckers inside the cysticercus cyst adjacent to schwannoma [Figure 2]a-d. The schwannoma revealed solid cystic areas displaying spindle-shaped cells having oval to elongated nuclei having clumped chromatin and variable eosinophilic cytoplasm without discernible cell borders. Verucay bodies were noted at places. Multiple hyalinised vessels along with congested capillaries were also noted. Schwannomas is a benign nerve sheath tumor usually located in the intradural extramedullary region of the spinal cord. Intramedullary schwannomas are rare, comprising only 0.3% of primary intraspinal neoplasms. The pathogenesis of intramedullary schwannomas is unclear; however, several theories regarding probable origin of these tumors have been suggested including ectopic schwann cell originating from embryonic neural ridge. The origin could also be from schwann cells extending along branches of anterior spinal artery, schwann cells ensheathing aberrant intramedullary nerve fibers, transformation of pial cells of neuroectodermal origin into schwann cells, displacement of schwann cells centrally during embryonic development, and from the dorsal nerve root entry zone and centripetal growth. Intramedullary schwannomas are mostly located in the cervical spinal cord (61%), followed by the thoracic region (29%). They may remain asymptomatic for a long time or cause a nonspecific complaint, which makes the diagnosis difficult. Pain is the most common presenting symptom. Uncommonly, they may present with motor deficiency, reduced sensation, and loss of genitourinary function. Intramedullary schwannomas are benign tumors posteriorly located in the spinal cord. Hence, a complete resection is the treatment of choice, if tumor is not densely adhered to neural tissue. Spinal involvement by cysticercus is rare and varies from 0.7 to 6%. This low incidence of spinal involvement compared to parenchymal disease is probably due to the fact that the blood flow to the brain is approximately 100-fold greater than to the spine. Intramedullary cysticercosis is very uncommon and only 45 cases have been reported so far. Migration of the cysticercus through the ventriculoependymal pathway and hematogeneous dissemination has been considered to be the possible pathogenetic mechanisms. The thoracic spine is the most commonly involved. The differential diagnosis of an intramedullary spinal mass is extensive, including neoplasms such as ependymoma, infections such as mycobacterial abscess and sarcoidosis. Treatment of NCC, SCC treatment is primarily surgical. Medical treatment of NCC is frequently effective, usually in parenchymal disease. The drugs of choice are albendazole and praziquantel, usually accompanied by antiinflammatory corticosteroids. 1. Scheithauer BW, Louis DN, Hunter S, Woodruff JM, Antonescu CR. Schwannoma. In: Louis DN, Ohgaki H, Wiestler OD, Cavenee WK, editors. WHO Classification of Tumours of the Central Nervous System. 4th ed. Lyon: IARC Press; 2007. p. 152-5. 2. Del Brutto OH. Neurocysticercosis. Semin Neurol 2005;25:243-51. 3. Shenoy SN, Raja A. Cystic cervical intramedullary schwannoma with syringomyelia. Neurol India 2005;53:224-5. 4. Del Brutto OH, Dolezal M, Castillo PR, García HH. Neurocysticercosis and oncogenesis. Arch Med Res 2000;31:151-5. 5. García HH, Evans CA, Nash TE, Takayanagui OM, White AC Jr, Botero D, et al. Current consensus guidelines for treatment of neurocysticercosis. Clin Microbiol Rev 2002;15:747-56.